Hunting and fishing has always been a major part of my life. Growing up in Northern Wisconsin has given me the opportunity to chase several species of wild game, as Wisconsin offers a wide variety of outdoors activities to enjoy. Since the days when I was a young child and being introduced into the outdoors by my father, Buck Marsh, I have been hooked ever since. "Remember, introduce someone new into the outdoors, they will appreciate it for a lifetime"
Hunting is a major part of my life. At 25 and a full time college student at the University of North Dakota, I still find time to get out and do one of my favorite hobbies, hunt geese. I like to hunt ducks too, but I would rather hunt them in a field apposed to in the water. Watching geese "maple leaf" in as we call it gets my heart racing and actually forget what I am doing, calling in the geese with my Zink Calls. Shooting and watching the geese fall that I know I shot raises my confidence to shoot another honker. Shooting geese Marsh Outdoors style is awesome, with my co team MO members, my Dad and other friends. I enjoy filming with my brother, whether it is for him, or taking turns in the field or in the water. Being on T.V. is an honor. In the summer of 2013, I joined my brother Jordan, to help represent Zink Calls Pro Staff . "Introduce a youth to the outdoors. They will appreciate it for a lifetime." Hunting and fishing has become a major part of my life, especially in the past 25 years. Having two sons that live and breathe to hunt and fish. I find it very enjoyable to spend time with my family enjoying the outdoors, whether I am fishing walleyes on the local lakes with my son Jordan in the local tournaments, fishing in Canada on our annual father/son fishing trip, shooting geese around home, or enjoying time in North Dakota with my boys, and their friends. I cherish every minute of it! I have been happily married to my lovely wife Wendy for 29 great years, as she is very understanding about our family being driven to hunt and fish. I own a used car lot in Rice Lake called Northtown Motors. I was born and raised in Rice Lake, and moved to Madison in my early 20's to go to college to become a barber. I moved back after graduation to come back up and enjoy the peaceful, quite, and serenity of Northwest Wisconsin. Filming with both of my boys has really opened my eyes to the true beauty we sometimes take for granted as outdoorsmen. Having the patience to let the birds work, taking the extra time to find the walleyes, helps me truly appreciate what our great natural resource really has to offer. Holt grew up in Stillwater, Minnesota and started hunting and fishing when he was 4 years old. Growing up, Holt only chased whitetails, pheasants, and small game. Now, he has expanded his chase to ducks, geese, grouse, and turkeys. Holt comes from a long line of hunters- his grandfather, dad, and uncle grew up waterfowling and eventually got hooked on bow hunting. Holt is also passionate about fishing and mainly catches walleyes, crappies, and last but not least, muskies. His family targets fish on many different lake and rivers, but they also have there home-held spots. Holt went to Woodie Camp (Waterfowl Education Camp) when he was 13 and has just recently started contest calling. His favorite place to hunt mallards or honkers is a Midwest fresh cut cornfield on a crisp November morning, with snow flurries and a slight northwest wind! He tries his best to stay ahead in school. School first, then the outdoors. Im Danny McLennan, 28 years old from Rice Lake Wisconsin. 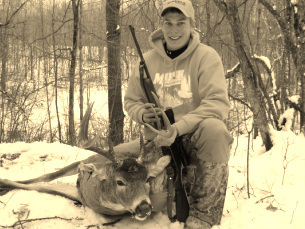 Until later in high school, I knew nothing but whitetail hunting. Once I started getting older and realizing the opportunities Northwestern Wisconsin had to offer I started taking advantage of many different types of fishing and hunting. Nowadays, I'm not relaxing on a beach on spring break, im Chasing monster gobblers in the hardwoods. During the summer months im on the water setting hooks on large mouth bass, not sittin' next the the A.C. When fall rolls around, I fall back in love with the crazy chase after green heads and honkers. Waterfowl hunting has grown to be my main love in the outdoors and it's been so great to learn and share that experience with some great friends. It's truely a pleasure being able to spend time in the outdoors with friends and family that share that same passion as you do and meet many great people along the way. Im very excited to be a part of Marsh Outdoors and have the oportunity to learn and grow as a sportsman with guys like me. It's hard to find a group of hunters that pride themselves on ethical hunting, family, friends, and true love for what they do. Only a few good reasons to why I will always be rockin' Team MO gear. I'm a small town farm boy from Southern Wisconsin. The outdoors have always been a way of life for me, its where I work, and where I play. Growing up hunting and fishing were a bit like the forbidden fruit, that I had to have, milking cows or field work seem to always get in the way. As years pass and the cows have gone the fruit is sweeter than ever, and yet work still gets in the way! I graduated from UW-Stevens Point in 2009 with a wildlife ecology and biology degree. Since then I have been working in wild turkey research for the better part of the past two years while continuing to farm crops around the Monroe area. I'm a fur feather fin kind of guy. If you have any of the above I'm coming for you! 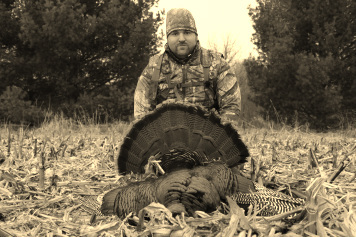 If I had to choose a favorite I would have to pick the big ole fat southern wisconsin thunder chicken! I love to call em close, listen to them spit, drum and flop around after a successful hunt!